What is the ROI for RT? True story: A pastor was visiting our facility. The pastor overheard the social worker asking someone to sign a ROI. There was ambiguity about “ROI” terminology. The pastor looked at me. He raised an eyebrow and asked, “What is the Return on Investment (ROI) for children in this program?” The pastor had a very good question. I explained that the social worker was making a reference to getting a Release of Information (ROI) signed. The pastor had one of those ah-ha moments. Let’s get back to Return on Investment for treatment. That is a question I wish I would have answered for the pastor. Health care in the United States is expensive. Costs are rising too. Third party payers (like Medicare, Medicaid, and insurance companies) often cover a large percent of these expensive costs. Third party payers want a return on their investment. Third party payers want to make sure their money is being spent on gaining outcomes. The outcome is very important. Third party payers do NOT want to pay for unneeded or unnecessary services. Recreation (in general) can be viewed as unnecessary. The belief is that a person with a serious illness doesn’t go to the hospital for crafts, swimming, and bingo. They go to the hospital for treatment and outcomes. Recreation for the sake of activities (in a health care setting) is deemed unnecessary. Unneeded services are cut. If they (third party payers) don’t pay for services then the client wont’ receive recreation services. 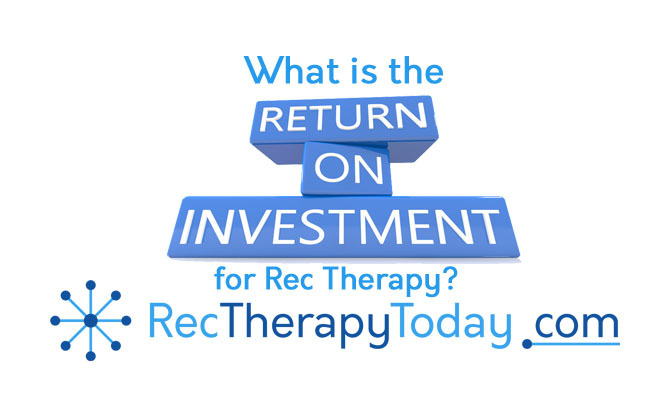 How do you get a Return on Investment in Recreational Therapy? It is vital that recreational therapy is focused on bringing about treatment related outcomes. It is imperative to write treatment plan goals that demonstrate an outcome. It isn’t about the recreation activity. It is about the outcome from the activity. It is important to document an evaluation of treatment and patient outcomes. This is like a receipt for services. Absolutely. We must look at this as treatment first.. Recreation second. I find other people branding our craft as experiential therapies and raking in the dollars…. Wording is everything.. Always has been…always will…we are Therapists.